Myself and my partner Trindy established Bulahku Kennels in 1994. We hope our son Jake, will have the same love of Cattle Dogs as we do and continue the Bulahku name well into the future. We are a small kennel with pups sometime's available. We started our kennels in Forbes Central West NSW and are now located near Townsville QLD. Over the years we have bred, owned and exhibited Supreme, Grand and Australian Champions. We are the only Australian Cattle Dog Breeders in North Queensland to have bred, owned and shown Supreme and Grand Champions. Home of Best in show (all breeds) winner, Supreme Ch Bulahku Blue Tyson. 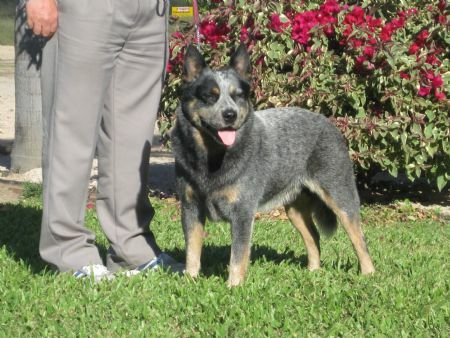 Tyson was the 5th Australian Cattle Dog in Australia to gain his Supreme Championship. The 1st Supreme Champion Australian Cattle Dog in North Queensland and the 2nd Supreme Champion Australian Cattle Dog in Queensland. With this and with 2 Best in Shows All Breed, 4 Runner Up to Best in Show All Breeds, 14 Best in Groups, 14 Runner Up to Best in Groups, 11 Classes in Show and 41 Classes in Group, Tyson is an exceptional Dog and we are very proud to have owned and bred him. Tyson is not the only Australian Cattle Dog who has done well for us. Grand Champion Lanbart Blue Dakota, " Jock" who we purchased as a pup and showed through to gain his Grand Championship is another great dog. Jock had 1 Best in Group, 7 Runner Up in Groups, 6 Classes in Show and 32 Classes in Group. Even though Jock is not with us now, his offspring are. We now own, thanks to Alan and Robyn Spargo, Grand Champion Pureheel Royal Titan ET. "Titan". Titan is a beautiful dog to own and show. He also is now part of the Bulahku "Champions" Team. Nowhere else in North Queensland will you find great Australian Cattle Dogs such as, Tyson, Titan and their offspring as well as Jocks offspring. These dogs are available for stud and also the sire's of puppies born at Bulahku Kennels. We are dedicated breeders who strive to improve the breed at all levels. We breed for quality not quantity. We hope you enjoy looking at our current and past dogs.